There were a few hitches in getting chicken day off the ground but finally last Wednesday was the day. Our wonderful (organic farmer) neighbor came over the night before to deliver his stainless steel processing table that he uses for his vegetables. 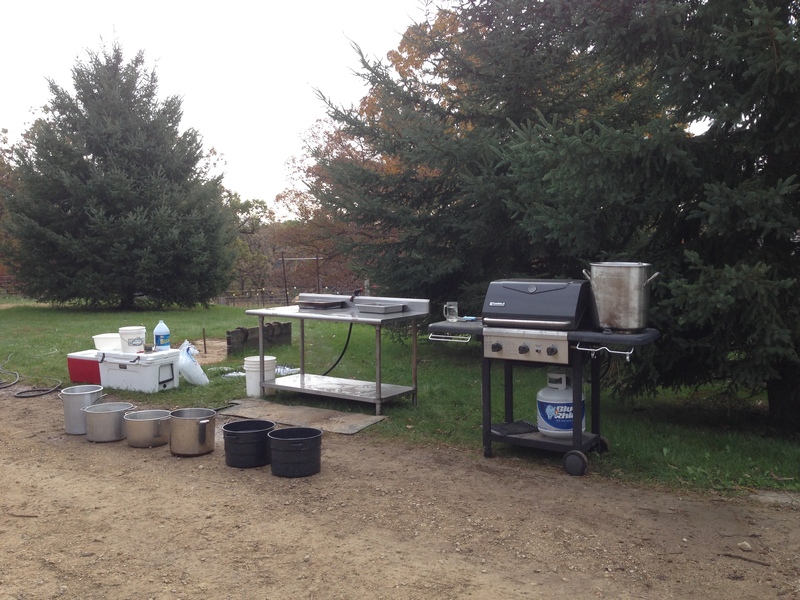 This time we would use it for cleaning the chickens and give it a good cleaning when done. As usual he didn’t arrive with empty arms and that night he brought some vegetables for the chicken dinner we invited him to a couple days after chicken day. 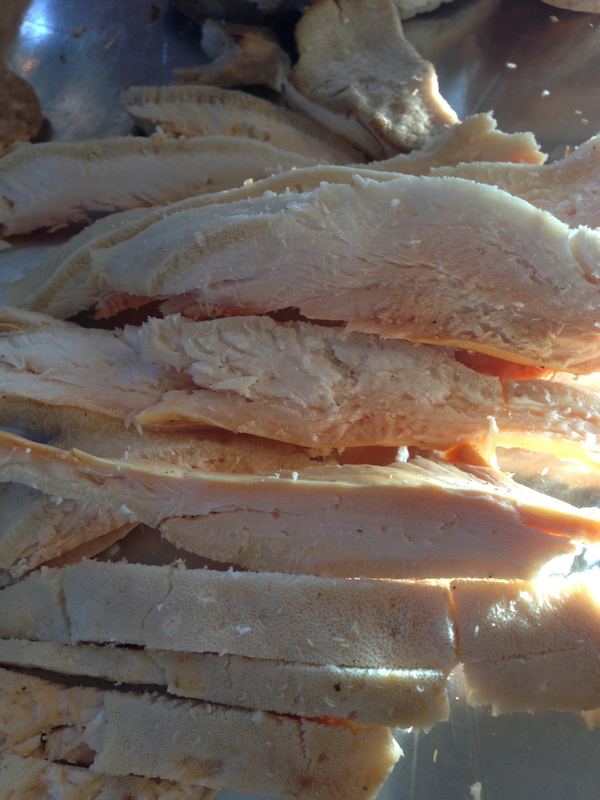 (It’s best to let the chickens rest for a couple days in the fridge before then get eaten or frozen.) These potatoes, which we ate with our chicken dinner, made the creamiest, cleanest tasting mashed potatoes ever. The carrots were light and sweet and full of flavor. 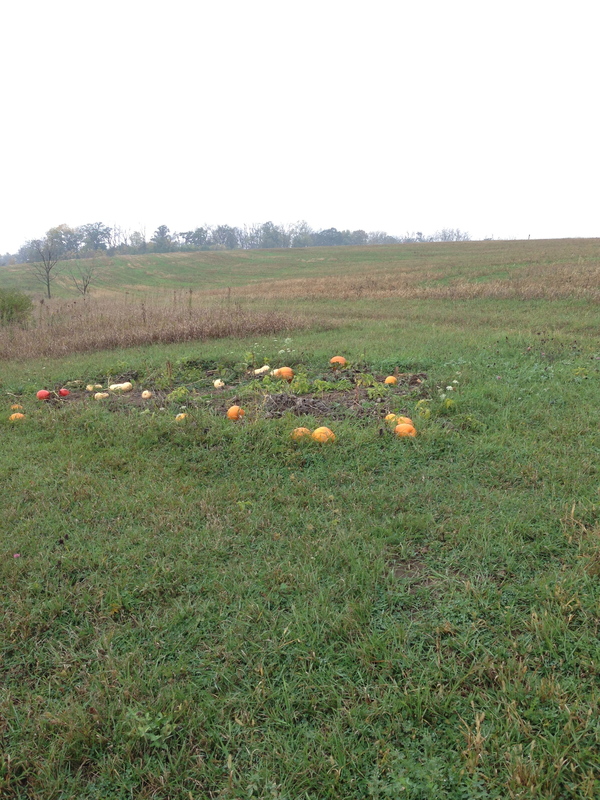 A neighborly vegetable offering toward the meal. This was our chicken cleaning station. The many pots of water lined up were my attempt at thinking there would be a good supply of rinsing water. It was all unnecessary, we used the hose with the spray head to clean and rinse the chickens but somehow the resource made me feel more prepared when I started the process. There were three of us and we all took turns at each job but quickly fell into our own niches and developed a rhythm. I had worried about what it would be like to kill the chicken, if I would be afraid to, or react badly to it, but it just didn’t happen. We’ve been planning this all along. We always knew they were for food, and that it feeds us and that’s the point. Not only does it feed us but it means we know where our food came from and that is rewarding. It took us about 4 hours and the last 20 minutes it snowed lightly while we we worked outside. Funny thing though, it just kind of added to it. It was a good experience for all of us. We were all more efficient by the last few chickens, and I can see it would go more quickly the next time. ok “graphic warning”. Parts. 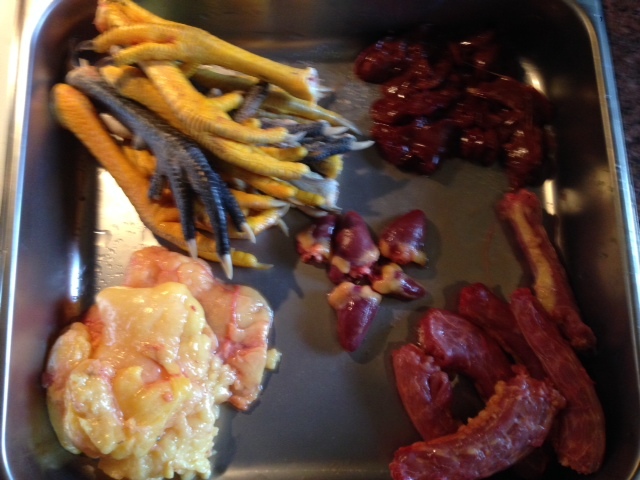 Livers, hearts, necks, feet, and fat. I need to find a video on youtube for cleaning the gizzard. That was the only thing I really was not prepared well enough for on the bird. Between our neighbor and us we have three dogs and so each got a heart. 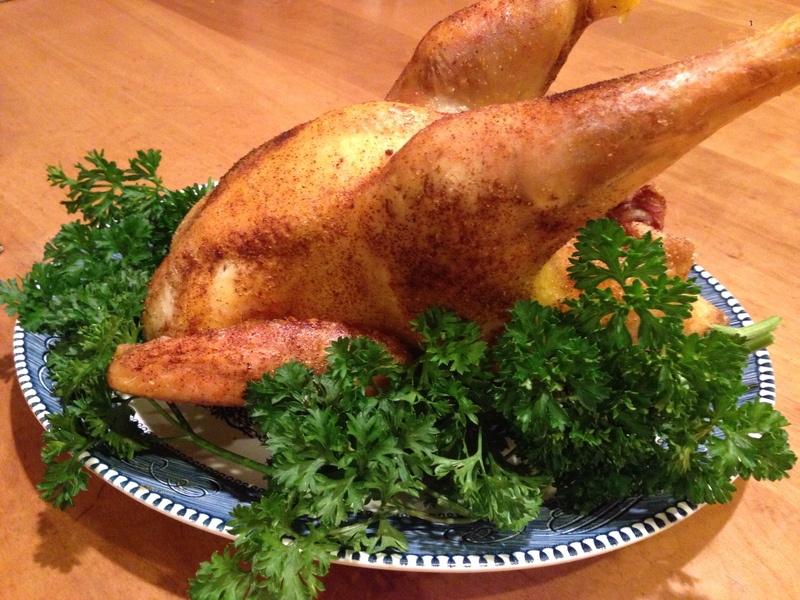 Finally the chicken makes it to the platter. 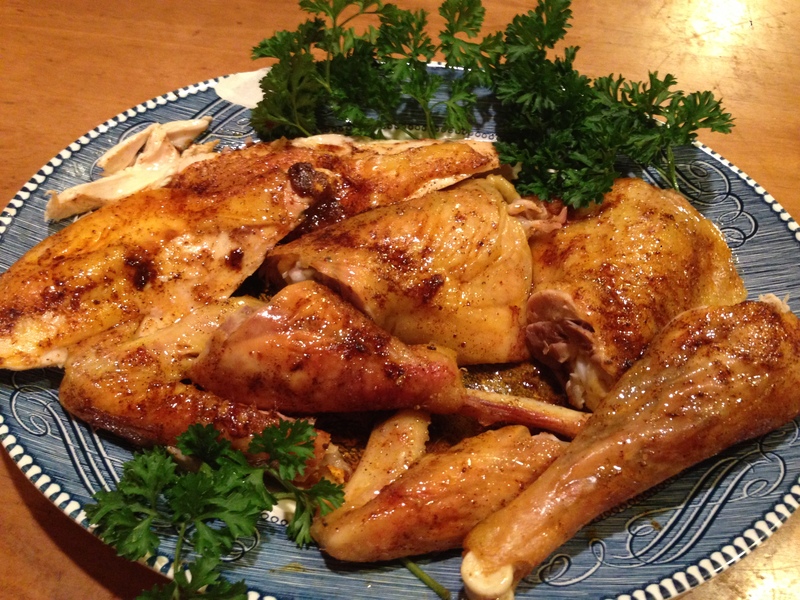 It was a beautiful bird, and we all enjoyed the fulfilling process, the taking responsibility, and the delicious meal. The bird fed three adults, two kids with tiny appetites, (who mostly were focused on the pumpkin cake with cinnamon frosting) and another dinner tonight. The well picked carcass and the rest of the bones, as well as one complete thigh are all in the freezer to make some delicious soup! 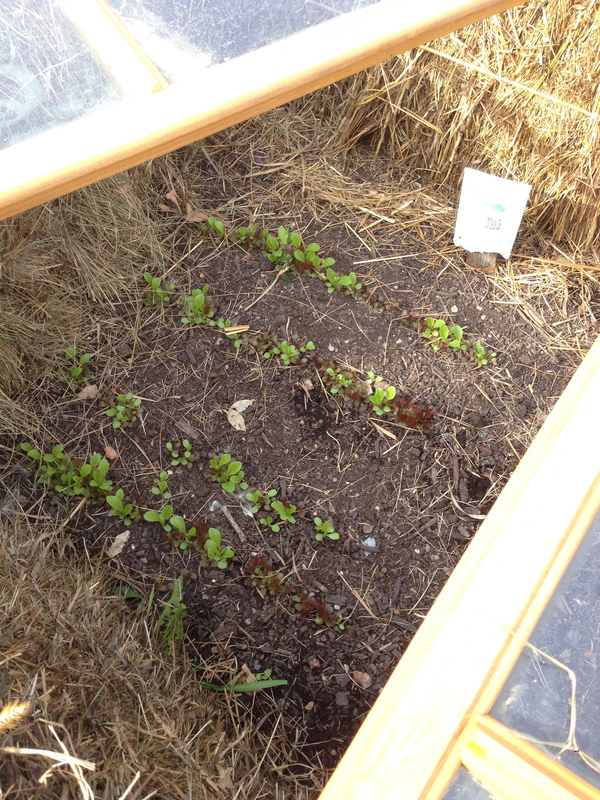 Other non-chicken news is that the experimental cold frames are doing really well. I think this will work great on a larger scale next year. 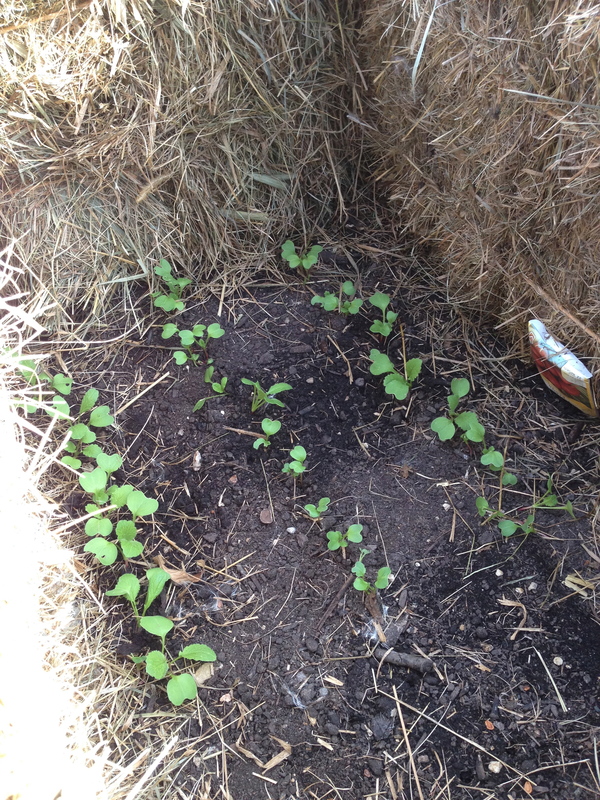 These radishes need thinning but they are growing very nicely. Maybe I’m easily excited, but seeing this pretty lettuce mix coming up in the middle of this very cool weather is pretty fantastic! Fresh salad in November! 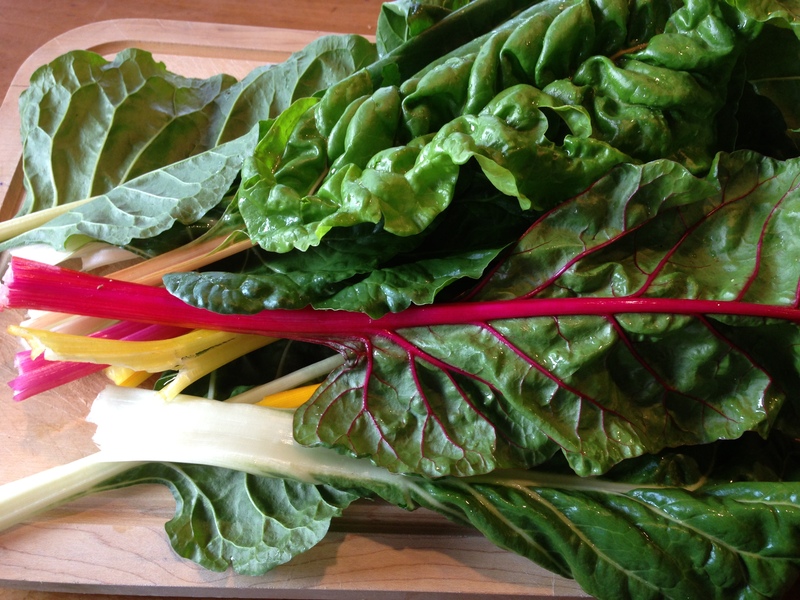 I’ve also covered the chard that was still growing in the garden and we will see how long that lasts, for now it is fresh and green, at a time most greens we have are in the freezer, apart from some parsley in the front garden. 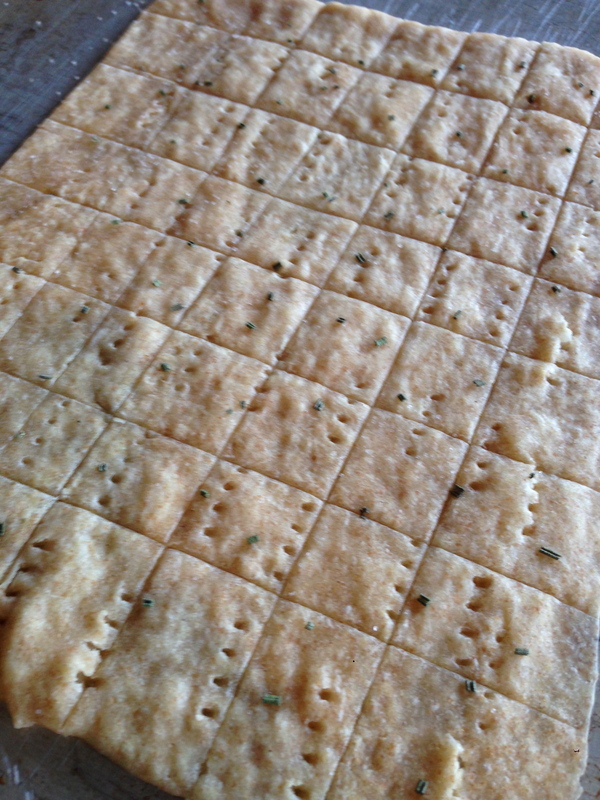 We had cheese and these crackers for appetizers, that evening, and some tortilla chips I made that afternoon and salsa from the summer. 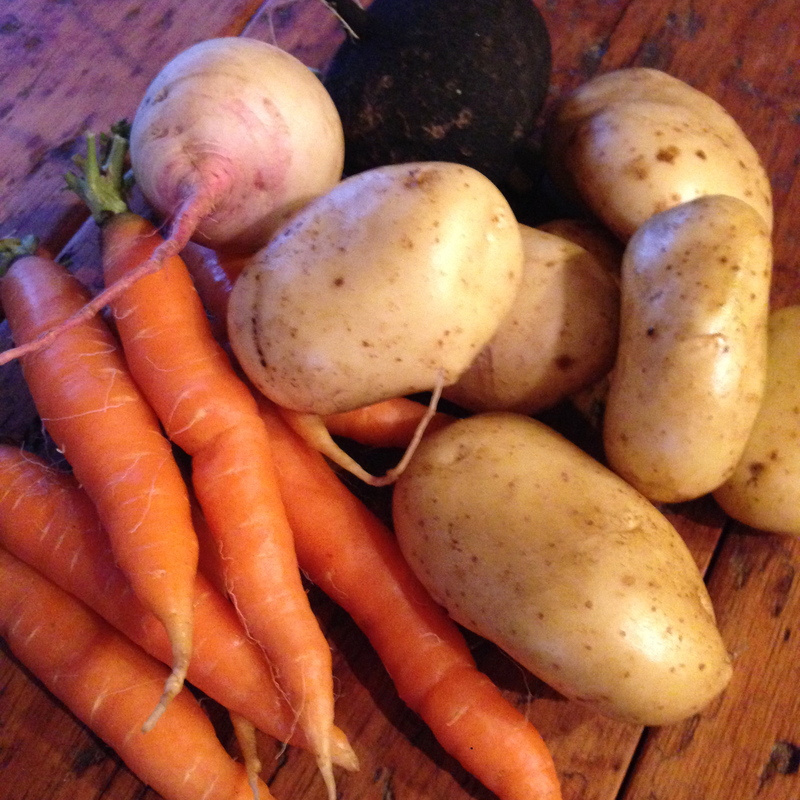 Along with a dish of our neighbors best ever carrot sticks. Dinner was roasted chicken, swiss chard, shiitake mushrooms and bacon cooked together, as well as creamy mashed potatoes, and thick crusted, chewy slices of no-knead bread. There was just enough pumpkin cake with cinnamon frosting for the kids to each have a well deserved piece. The grown ups were happy with a lovely white wine from North Carolina, gifted to us for the occasion by my thoughtful sister. It’s been super foggy, misty and rainy, and very midwest Fall. I am collecting my pumpkins and roasting them in the oven to freeze. I now have many bags of measured cups of pumpkin. Do I make a lot of pumpkin bread during the year and not just in Fall? Well, no I haven’t in the past but I also haven’t in the past committed to working within the season OR working with what I have put by. 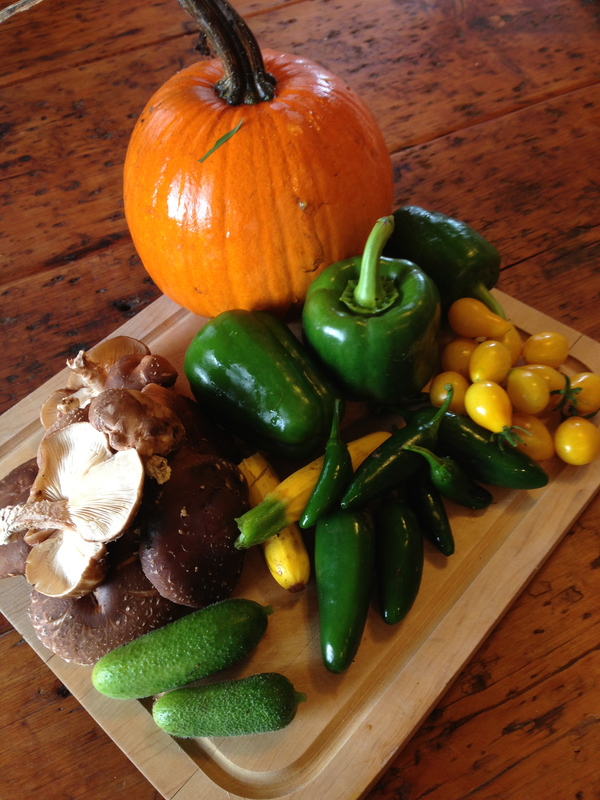 I do not want to buy out of season this year, by using foods that have traveled half the country or more. If I put it by myself I will eat it out of season, if I didn’t then I will eat what I have! That is my goal, and so far it’s going pretty darn well. This winter we will have our own pork, chicken, eggs, broccoli, asparagus, yellow beans, green beans, asparagus, corn, collards, chard, kale, pesto, cherries, strawberries rhubarb, peaches, tomato sauce, ketchup, mustard, bbq sauce, pickles of all kinds, relishes, jams, syrups and more! After my re-viewing of Food Inc. I feel warmly reaffirmed in what we are doing. Financially it has been a bit of a hardship year with hubby building the infrastructure of our little homestead, such as fencing pasture after pasture for the cattle, chicken runs, pig yards and baling hay for the animals. He’s been working hard, and the gain is tangible and an investment in our future homestead but it has not filled our wallets. My venturing into my granola business a year and a half ago has hasn’t filled our wallets either, but its holding it’s own and showing great promise. It’s all worth it though, I’m proud of what we re doing and it feels good to be living this way. 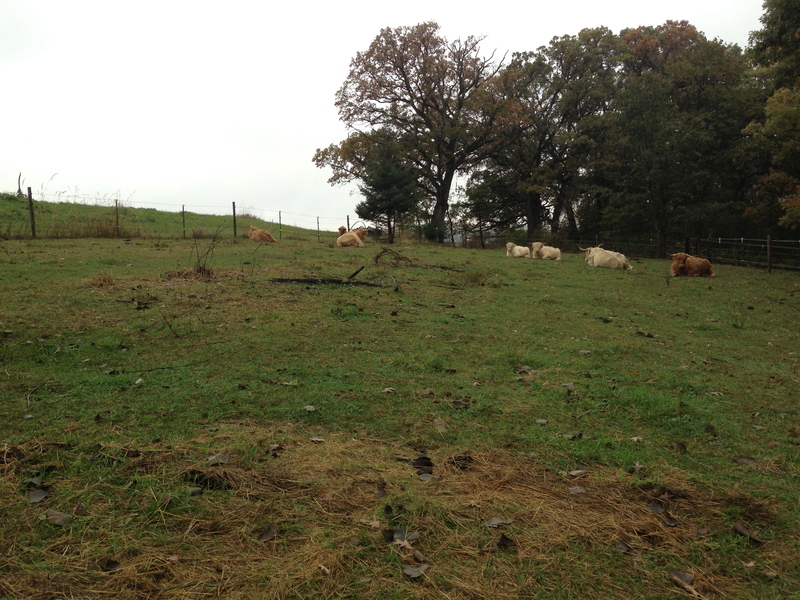 Here the cattle are enjoying the mist, and the quiet. You’ve heard people say, “it tastes like chicken”. Well in this case it LOOKS like chicken, doesn’t it? It’s a Chicken of the Woods Mushroom. It was about a 10 pound mushroom growing on a tree. I dehydrated much of it for stews and soups and cooked up the rest with a bunch of onions. It was very tasty! The Shiitakes are coming in nicely now. Check below for what happened to these beautiful little finds! 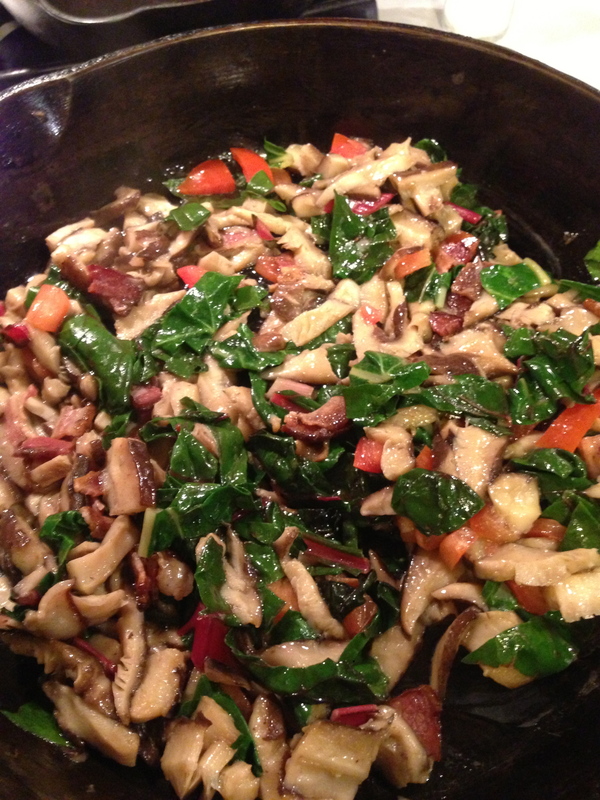 Here is where those mushrooms went….a little local bacon, some peppers, shiitakes, and chard from the farm and tomatoes from our organic farmer neighbors. All that over pasta, do I have to say YUM, or is that pretty obvious?! I still had a bit of purple cabbage and green cabbage left. Next year I will time my cabbage so it is all ready in the cool of the Fall and I can store it, but this year I planted it too early. So time to just use it up. I combined this with our few carrots, and some frozen corn. 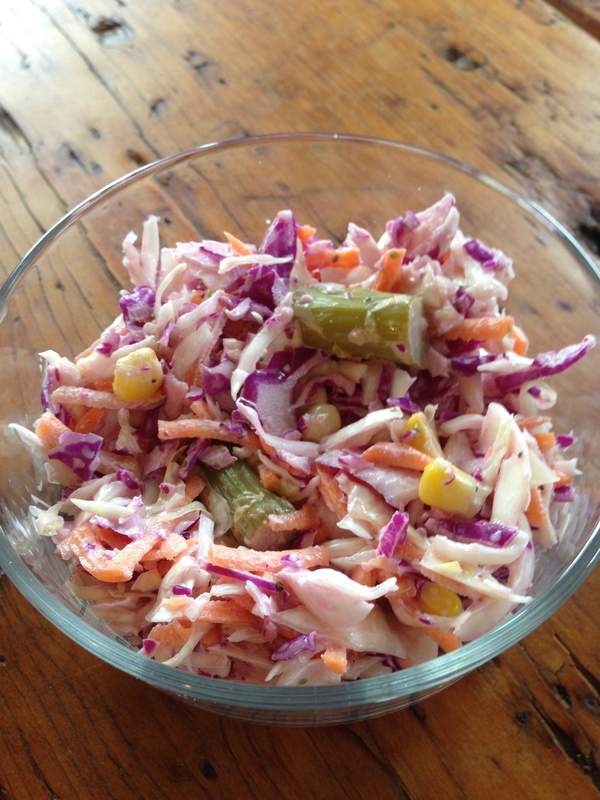 Then threw in some pickled asparagus to make a really delicious coleslaw. This and that from the garden today…. Aren’t vegetables pretty? 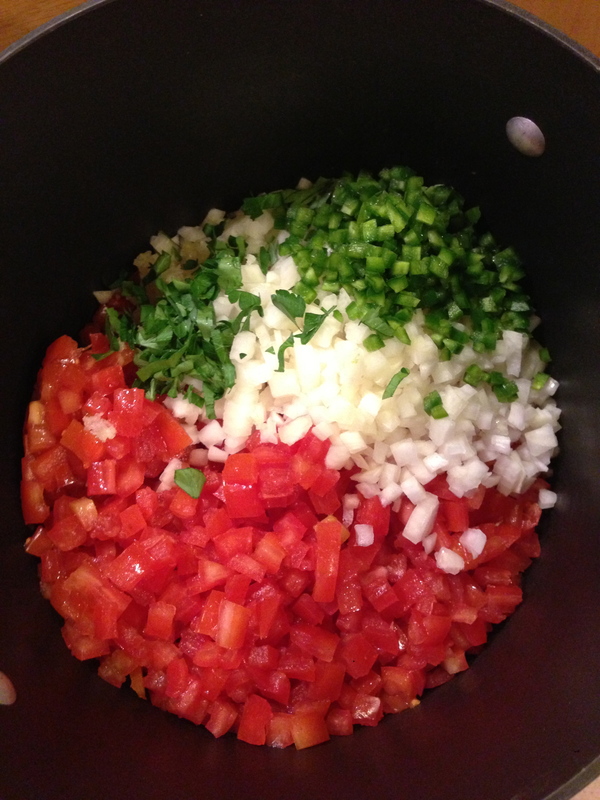 Here is my last batch of salsa. I got one last (child care for vegetable) bartered batch of tomatoes from our neighbor. 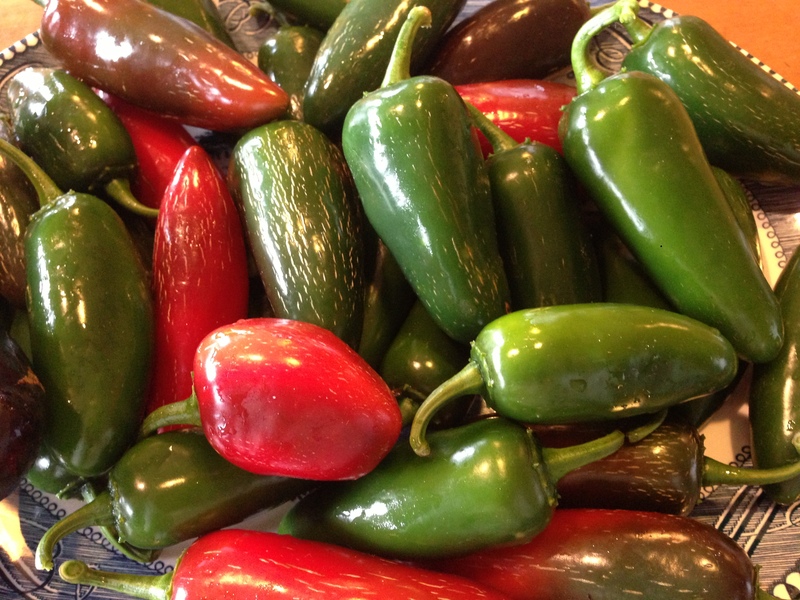 These San Marzanos are awesome for salsa! Finally shut the kitchen down tonight, with the salsa done cooking, the pumpkin in the freezer, and the crock pot cooking up dinner for tomorrow night, (local pork and my own bbq sauce from this years tomatoes), it is time to call it a day. Tomorrow is a big granola baking day, 4 batches! I will make some coleslaw and buns in the morning before going off to bake, and then come home to a delicious pulled pork dinner:) After a big baking day tomorrow the next day will be all about planning the logistics for chicken processing this weekend. It will feel good to have that done, and know that the next year when we do it, we will no longer be newbies at it! The days are getting shorter and much cooler at night and in the morning. It’s funny that the house retains the cool overnight, and it seems like layering is needed to go out, but the days are actually quite nice yet, hovering in the low 60’s to low 70’s, so much for layers, but it’s a good reminder to pull out the long johns and cooler weather jackets and hats, yup, it’s coming! The garden is in stages. Some areas have been pulled and cleaned out, while others are still producing. The Kale and the Chard are loving the cool weather and producing fresh young leaves. I’ve cried uncle on the apples…I may still dry some, but there are so many on the farm I could never even dent what is out there, so I will have to be happy with enough apple sauce for next year, some in jars on the shelf, and some in the freezer. We will use the frozen first and then the canned sauce, with all the pork we will have this year, lots of applesauce seemed to be very fitting! Coming in from the garden is not like it was earlier in the summer with a full bucket of tomatoes, arm loads of greens, and buckets of potatoes. Now it is a bucket that looks more like I went to a garden buffet…2 small summer squash, a small pile of cherry tomatoes, a few leaves of basil, 3 small cucumbers and a surprise yesterday…3 carrots! On my notes for next year’s garden is to do better with my carrot beds. Carrots were my least successful vegetable this year so three suprise carrots were a welcome addition to the buffet bucket! The volunteer tomato plants to my surprise are suddenly producing, so I’ve been collected tiny yellow pear tomatoes as well. 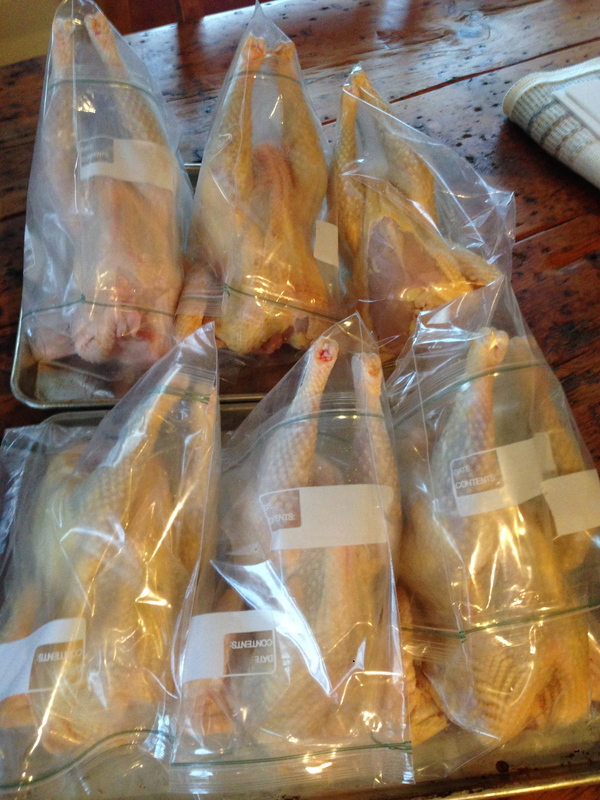 It has come time to face the task of getting our chickens into the freezer. This is a task that sounds easier on paper. I know it will get to become an annual task but the first time it is daunting at the very least. Thanks Eivin for your quote….”I’m not a meat eater that buys meat in a package, I am a meat eater that kills their own meat.” I will feel proud to be able to say that, and feel responsible for the meat I eat, even on such a small scale as my first 6 chickens. Although nowhere at your level Eivin. I’m a total newbie, but ‘ya have to start somewhere!! I would hope to be able to say that and will strive to fully be that meat eater some day, but it will take transition time. Sidebar note….I am taking a hunter safety class online. I don’t have a plan to hunt this year, but next year I will at least have the knowledge to make that decision. So I continue to read about butchering set up, and proper handling of the process. It has to be done soon though or it will be a very cold process outside doing this. I have made decisions on which birds to cull. I also made a decision that since our birds are well protected by fencing and a netted overhead, I really don’t need the roosters. Maybe at some point I will decide differently, but I am fine just purchasing more baby chicks next year and as they become layers the layers I am keeping now will become stewing hens. The roosters are rough on the hens during mating and they can actually be hurt in the process, and although the sound of a rooster on a farm morning is quaint and wonderful, it is less quaint when it happens all day long. My roosters haven’t figured out that early in the day and late in the afternoon is plenty enough to crow about! So with my roosters numbering 3, I had to also pick 3 hens for the freezer as well. This decision was made easily. Wyandottes I’m told are great meat birds, so those the three hens will go, leaving us with 2 laying Australorps and 3 laying Buff Orpingtons. These hens are a few weeks short of laying right now, and I am excitedly waiting for our first egg! We watched a disturbing dvd last night about the egg industry… of course it was presented by the Egg Board, so no free rangers or pastured chickens in the lot. We did learn a lot about the history of egg production and about the formation of the egg and found that part to be an amazing a beautifully designed process. Having seen that and feeling awe for the whole process, it was a dichotomy watching then the high production egg business which seemed to make a mockery of the beautiful natural process of the making of an egg. It was anything but natural, and I kept thinking of the title of Joel Salatin’s book “Folks, This ‘Ain’t Normal”. We also watched “Dive” which is about the stunning amount of food wasted from businesses everywhere. So many hungry people and so much good food going in the garbage, this one doesn’t seem hard, and it’s sad to think about all the good uses it could go to instead. 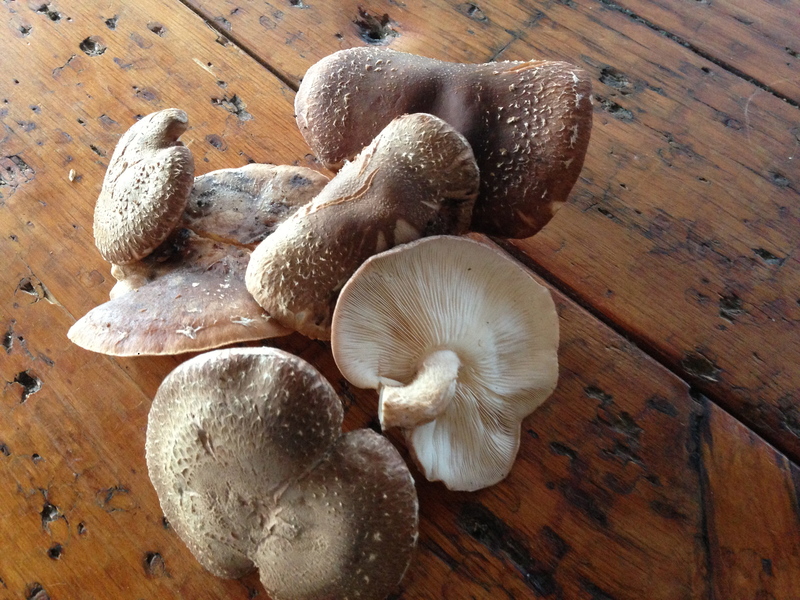 On a great note, Hubby gave the Shitake logs another soaking and seems to have motivated them to produce. 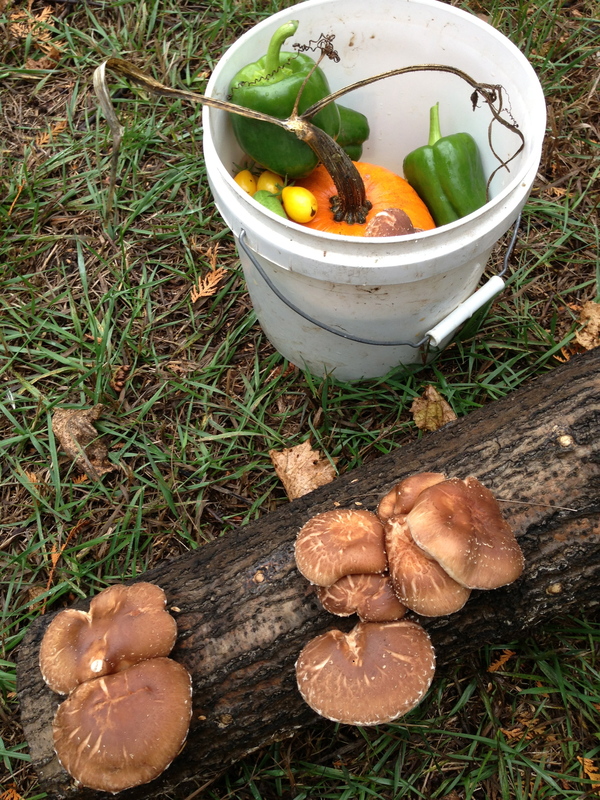 It is wonderful having delicious mushrooms on the farm. He also foraged a giant (10 pound) Chicken of the Woods mushroom, which we are still trying to figure out how to use in enough ways! I will post a picture of it if he has one. 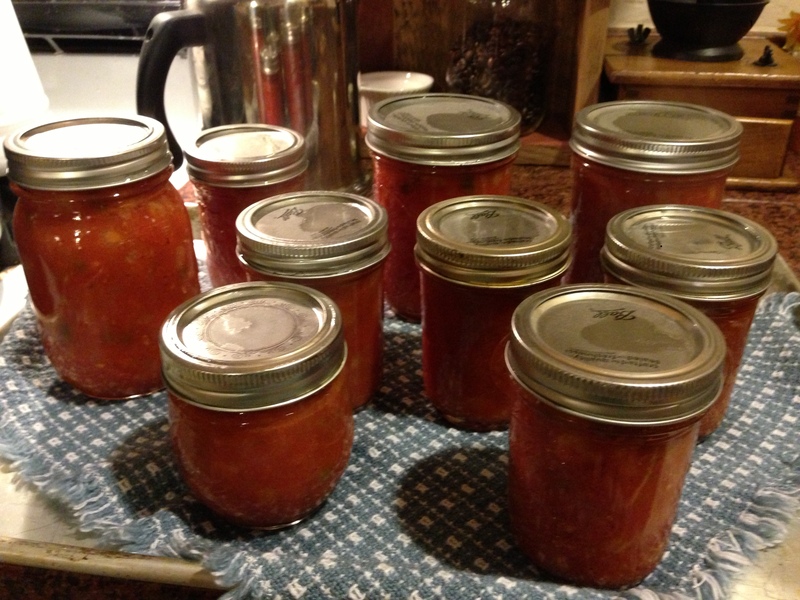 So with the last applesauce made, and one final batch of salsa coming up this week, the last processing may be making pureed pumpkin for pumpkin recipes, such as breads and muffins and soups during the year. Our focus is turning toward firewood gathering, kindling gathering, cold frames (my radishes, lettuces and spinach are just coming in), and securing potatoes, carrots, onions etc., from my two friendly organic farmers/neighbors, to last the winter and into the spring. 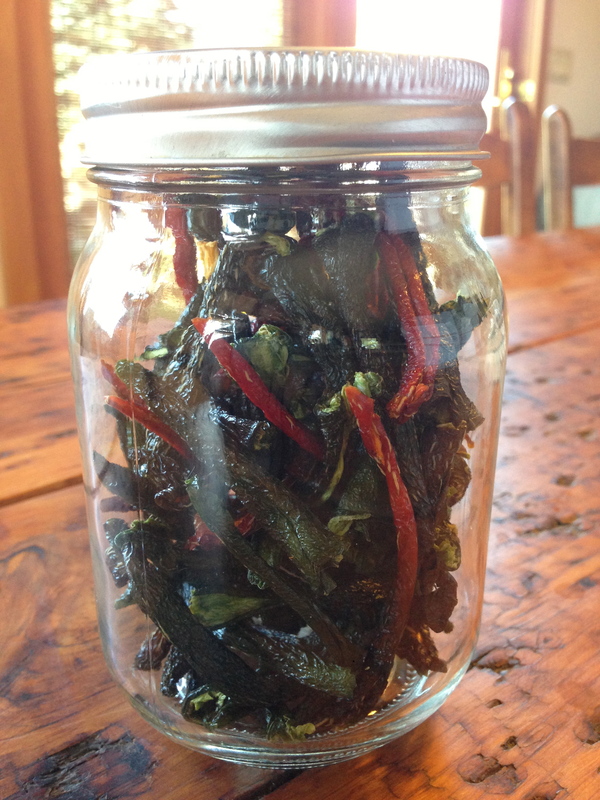 …that turned out to fill this small jar. But they were already great in a pot of Chicken Tortilla soup I made yesterday, and there are more out there to dry as well. All in all, life on the farm is going well, now off to go bake granola for my baking business. It is getting to the time where I will be gearing up for my “Winter Gift Giving Jars”. This is an exciting time. Last year was a trial and this year I’ve purchased 100 jars for starters. I am looking forward to seeing the response to these!